WORLD PREMIERE. Written by CARMEN PELAEZ. Amidst cut-throat competition at a renowned auction house, Camila has just been promoted as the head of the Latin American Art Department when she is presented with one of her great-aunt Amelia Pelaez's paintings as a last minute inclusion. The authenticity of the painting is questionable, Camila's dedication to her great Aunt is not, forcing Camila to decide between her own burgeoning career and Amelia's legacy. 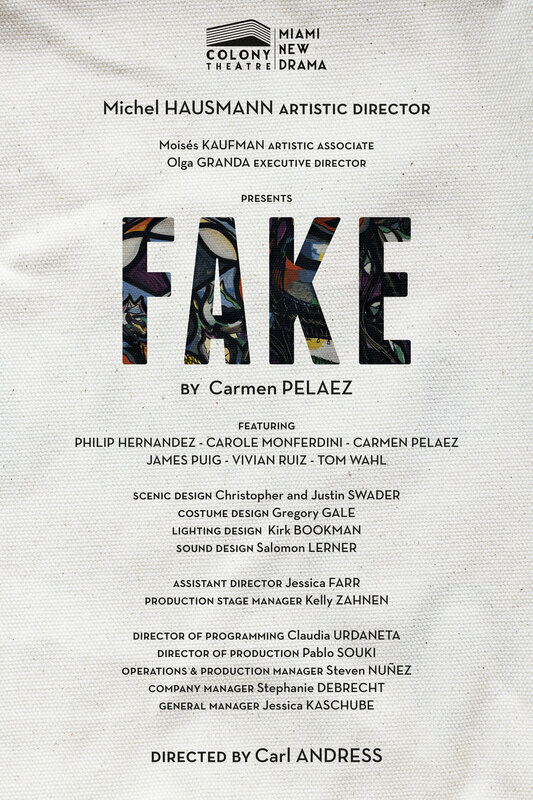 Written by Cuban-American playwright and Miami native Carmen Pelaez, this exciting world premiere thrusts us into the world of high stakes art dealing, Cuban politics, and a thrilling pursuit for the truth. Absent from Miami stages since her extended run of Rum and Coke at the Coconut Grove Playhouse, Ms. Pelaez will also star in the new play.